We’d like to wish our families and friends a very Merry Christmas and hope you have a relaxing and enjoyable holiday break. We would like to thank all of the visitors to our blog – we hope you keep visiting next year. We are on holidays until the end of January!!! Our school year has nearly come to an end so here are some photos that highlight the amazing year we’ve had – boy have we been busy!! We’ve been having some Christmas fun today and decided to Elf Ourselves! We used a website called Elf Yourself. We think we look pretty cool!!!! Here’s Matthew, Cooper, Louis, Hannah and Thomas. Here’s Amy, Kasey, Sarah, Sam and Harry. Here’s Katie, Will, Paul, Jordan and Maisie. Here’s Mitchell, Layla, Amelia, Emma and Trent. The lucky last group is Ella, Brodie, Jayde and Miss Sporn. Have you tried to Elf Yourself? Give it a go!! We had a lot of fun and our rooms look very festive with all of our decorations on display. We’d like to say a huge thank you to the parent and Grandparent helpers – they helped every child at their activity, gave us really clear instructions and did an amazing cleaning up job!! What did you enjoy about our Christmas Craft morning? Did you have a favourite activity? Amy and Harry are our SRC Reps – this means that they represent our class at meetings every 2 weeks at the Student Representative Council meetings. On Tuesday all of the SRC Reps had a barbecue to celebrate all of their efforts during the year! 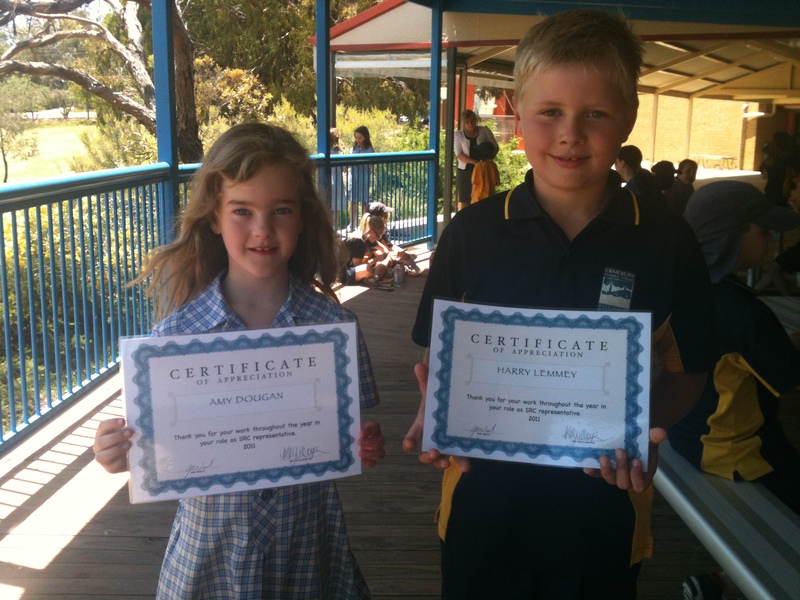 Here are Amy and Harry with certificates for their hard work! We’d like to thank Amy and Harry for representing our class at their meetings, running class meetings and reporting our ideas at the SRC meetings. We have had an amazing week of learning from our Sharing Time topic. This week each student was invited to bring along a Christmas decoration and teach us how to make it. This involved a lot of organising by each student. They needed to remember their day, to bring along the materials they would need and work out how to teach the whole class how to make each decoration. We made pine cone Christmas trees, snowmen, snow flakes from paper, paper plate angels, baby Jesus’ using rocks, paper baubles, Christmas bonbons (with a surprise in each), macaroni angels – gold ones, foam Christmas trees, potato printing to make wrapping paper, pop stick snowflakes, paper stockings, pop stick ornaments, peg reindeers and many more!! 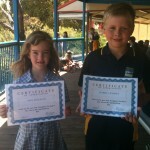 Most of the class completed our sharing topic – it took most of each day to actually finish each activity. Our classroom has been transformed – it looks like Christmas has really arrived. We’d love you to pop into the classroom and have a look – most of our decorations are hanging from our Christmas coat hangers! Here are just some of our photos.